Branding is a symbol of the market identity of a particular company. It is basically a tool by which companies are able to build their own identity, communicate what their products are or stands for, express quality of their services and projection of their business trustworthiness and reputation. The approach to managing brands strategically has changed significantly in the past few years as social media interactions, social media platform usage, and online consumer transactions have increased. This increase in customer interactions has generated massive amounts of data, creating new challenges every day for companies trying to maintain, manage, create, or change their brands. In order to promote a brand, brand marketing, digital marketing, and engine optimization are just some of the funnels of marketing that brand companies use in promoting their products, services, and brands to their targeted customers. However, whatever marketing tactics companies may apply in brand marketing and management, their marketing goal remains “to focus on customers and meet market demands ”. However, irrespective of the marketing tactics used by companies in brand marketing, their marketing goal remains one, that is, to focus on their customers and to meet the demands of their market. Brand managers will always be consistent in pointing out that marketing campaigns focus on customers. Just like business wants to promote popularity and brand awareness within their target market segment, it is also important for businesses to understand how they should build customer relationships. Building a customer-centric digital business can prove challenging, especially when you have to build a solid relationship with various customers worldwide. Direct customer relationship is likely a more promising strategy when it calls for brand popularity optimization, especially with the social media marketing trends of running a business. However, how can the brand companies learn more concerning their target consumers? This is where big data science takes an important role in brand marketing. Whether you are positioning a brand that is higher than competitors or creating a new brand from an old one, companies will have to access all key future and current customer touch points in order to draw useful data inferences (intelligence) and formulate the strategy. Fostering customer relationship will require businesses to have insight on the preferences and needs of their customers. This is vital for brand marketing since it helps an online company to have a specific target market it knows better in terms of their related shopping activities and customer purchasing experience. For many years, businesses have been collecting linear data for purposes of digital marketing. However, with the developments in technology, big data analytics came and is today innovating how brand marketing approach is done by the most famous brands in the industry. With the big data analytics development that requires serious data security measures, the last thing a company would want to hear is signs of hard drive failure for their PCs that may lead to losing this crucial data for their businesses. For this reason, companies today have invested in measures to arrest any signs of hard drive failure early enough to avoid the hustle of data recovery after losing data. Data analytics has emerged in a new form, infusing brand marketing campaigns with a more clear and accurate analysis of how brands can interact and connect with their target market and consumers. 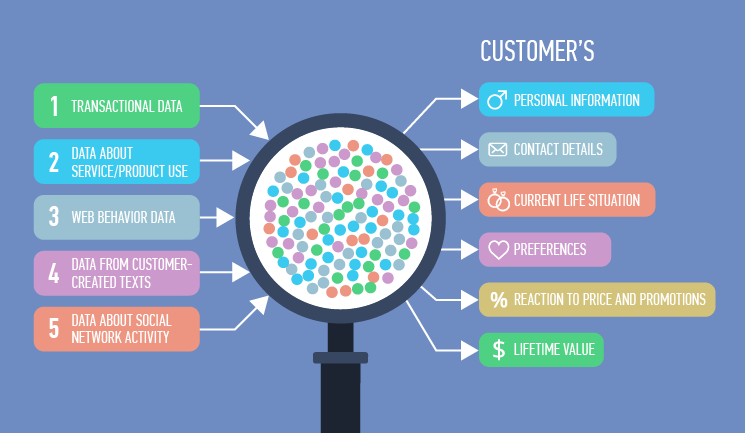 Instead of collecting data linearly, the new approach to brand marketing is using circular data analysis, that involves customer shopping activities,behaviorss, and preferences for a brand, service, or product. For every retweet or Likes of potential customers to a brand’s Twitter or Facebook page, data analytics system processes important metrics that set aside specific results to understand your customer’s preferences patterns for digital products and services. All businesses strive towards their customer satisfaction and big data analytics makes this process much easier. This makes the digital marketer more experienced in delivering more accurate results in their online marketing campaign by supplying their customers with the kind of products and services they need and want. Most companies have been relying on their gut to determine what products and services their customers may like and want. This, therefore, becomes their marketing campaigns incompetence. With big data analytics technology, data reports help in providing leads that can assist marketers to understand their customer behavior more accurately. Big data can help in enriching a brand company’s customer engagement and marketing model. You can improve branding by using the data acquired from customer’s purchasing and shopping behavior. This can assist marketers with insight on how to personalize a customer’s shopping experience and carry out a more personalization approach to marketing models for the company for better future customer engagements. Big data analytics also helps in pointing out the existing marketing weaknesses. Brand marketers may use big data analytics to see possible market indicators that will show the market trend their brand may fail to address. It may also assist marketers with more knowledge about their marketing strategies weaknesses and the direction they can take to elevate their brand to more engaging customer-centric and engaging brand to their target market. Data analytics can also be used by brand marketers to enhance a company’s marketing experimentation process. Each aspect of the digital marketing schemes can be considered based on a customer’s behavior and data, and companies may use a vast range of marketing strategies in order to accord their customers better product or service experience. Brand companies can use big data technology as a loop. They can use big data parameters to analyze whether a brand marketing approach is working to their expectations and ability to engage customers. With big data analytics, digital marketers can transition from one approach of marketing to another easily until they realize one approach that yields better product interaction and customer response. Big data analytics also provide new understanding in marketable approaches, which were never in existence before. For instance, digital was unable to know the kind of products, services or brands their customers usually search online. Big data analytics helps digital marketers in translating and defining data in order to obtain fresh marketing views, which will make their brand more responsive to market demands. A brand marketing strategy pervaded with big data analytics helps big time in providing marketers with a wider understanding in developing better customer response and product engagement to your businesses. Big data is key to brand management especially in this age of digital marketing.